A lot of innovation happens at every YCS, and it’s always cool to see what the best players do with top-performing strategies that most Duelists think cannot be evolved further. Half of the tournament happens before Round 1 even begins, as Deck building and preparation are just as important as your actual play during the event. Master Duelist Billy Brake is known for his off the wall thinking, but his repeated success across years of tournament play really showcases how great a Duelist can become if he goes all in on what he believes. The biggest difference that Brake wanted to highlight about his strategy is his use of Arkbave Dragon and Amorphage Goliath. Number 95: Galaxy-Eyes Dark Matter Dragon is an absurdly powerful card. Foolish Burial is Limited, and yet this massive Xyz Monster lets you send whatever three Dragons you want from your Deck to your Graveyard to set up huge plays. Brake’s strategy is much more focused on summoning a Rank 8 Galaxy-Eyes Xyz Monster to make sure that he can ultimately summon Number 95: Galaxy-Eyes Dark Matter Dragon on his first turn and dump Arkbrave Dragon and Amorphage Goliath to the Graveyard, typically along with The White Stone of Ancients. During the next Standby Phase, the Arkbrave Dragon will trigger to Special Summon the Amorphage Goliath, locking the opponent out of their Extra Deck! This essentially gives the combo Blue-Eyes strategy a way to lock the opponent out while building an impressive field, meaning that the Duel is very likely to end on the following turn. It’s super easy to make Rank 8 Xyz Monsters in a Blue-Eyes Deck, but Brake has included even more tools to make it easier. Both Ancient Rules and Silver’s Cry play big roles in accelerating Level 8s onto the field. Ancient Rules is especially great here because it’s very easy to find Blue-Eyes White Dragon and you will always have it in hand after Special Summoning Blue-Eyes Alternative White Dragon. Ancient Rules is essentially a way to extend your play further that synergizes well with the strategy. Another very cool inclusion that Brake has put into his Deck is a single copy of Mathematician along with Master with Eyes of Blue. In any starting hand, Mathematician can be used to just send Glow-Up Bulb to the Graveyard, which efficiently gives you a Tuner while also leaving you a Mathematician that will draw a card once it is destroyed by battle. However, once you have a Blue-Eyes in your Graveyard, you can send Master with Eyes of Blue to the Graveyard instead with Mathematician, which is another way to get a Level 8 monster into play. Master with Eyes of Blue can be shuffled back from the Graveyard into your Deck while sending the Mathematician to the Graveyard to Special Summon whatever Blue-Eyes is in your Graveyard, including Blue-Eyes Alternative White Dragon! Mathematician can essentially upgrade itself into one of your most powerful threats at no cost, and you also have the option of sending something to the Graveyard like The White Stone of Ancients or The White Stone of Legend instead with Master with Eyes of Blue to make some cool stuff happen. The last aspect that makes Brake’s Deck unique is that it contains a total of 45 cards. Most Duelists do their best to stay at 40 for good reason, as the less cards you play the more likely you are to draw your best cards. However, in certain strategies it is correct to go above 40, and Brake believes this is one of them. By going to 45 he reduces the chance of drawing the key combo pieces he wants to keep in his Deck so that he can send them to the Graveyard with Number 95: Galaxy-Eyes dark Matter Dragon. The higher card count also decreases the odds of having multiple copies of the same card, and when you have so many large Dragons that can sit in your hand you would much rather have a variety of tools to work with. Even at 45 cards, the odds of him drawing something he plays three copies of isn’t substantially decreased versus 40 cards, and he’s really just trying to make sure he doesn’t wind up drawing Arkbrave Dragon or Amorphage Goliath when they are integral to his game plan. 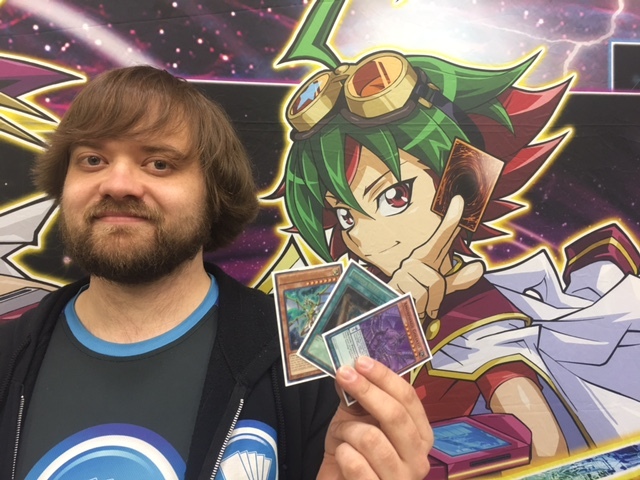 Billy Brake previously won YCS Dallas with a 60-card Deck featuring Shaddolls, Burning Abyss, and Artifacts; so if there’s anyone to believe about increasing Deck size, it’s definitely him. While Brake didn’t make it into the Top 32, a few other Duelists who also used a strategy similar to his are still in contention! Will a Blue-Eyes Deck utilizing this new tactic end up on top?